This entry was posted in Announcement and tagged blue, colors, dark red, green, scooter, twi'lek, yellow by arealight. Bookmark the permalink. I just can’t wait to get dark red Binocular visors! I love your store and I always will! I’ll buy a ton of ’em! The visor will look so awesome on my army. Great job on the dark red. Thanks guys for the supports. We might also release one more new color, just not sure yet what if it could make it at the time. It’s Tan! Regarding of the previous helmets I did, sorry there is any update yet. Well, if there is any good news about them I will let you know at first folks. @lycan_123: Yes, we will make more printed item in these new colors. And we also like to print our more products if possible. Thanks for your suggestion. And I am sorry that I can’t share the printing company with you. @bob: Thanks, Regarding of the helmet, To bring them into plastic ABS is complex production. Which mean that it taken many money and lot of time. If there is any new update I will let you guys know. 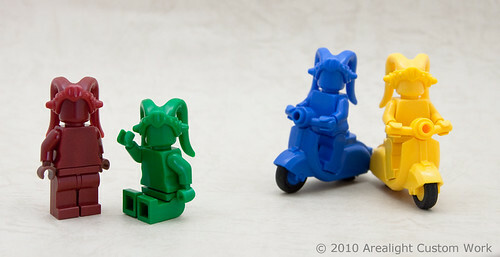 Hey arealight, wouldn’t it be so cool if you yourself sold FULL minifigs? Like commander cody with Thelittlearmsshop weapons.